Salt is an effective preservative for many foods, and that's no secret. Here's a DIY way to make your feta taste fresher, longer! Feta is a white crumbly cheese traditionally made of sheep's or goat's milk. It's cured and stored in brine (a solution of salt dissolved in water), but once opened, it can dry out or spoil quickly. To make it last longer, here's how to make your own brine. Dissolve 2 tsp. salt in 1 cup water in an airtight container, then submerge the cheese in the water. The feta must be completely covered, so make more brine if you don't have enough. Seal the container and refrigerate it. The feta will keep up to 3 weeks. 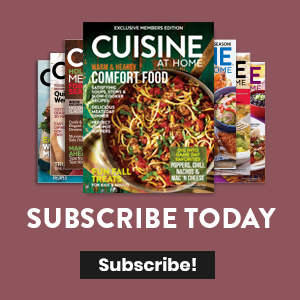 Sign up for your newsletter! Want More Sneak Peek Recipes? 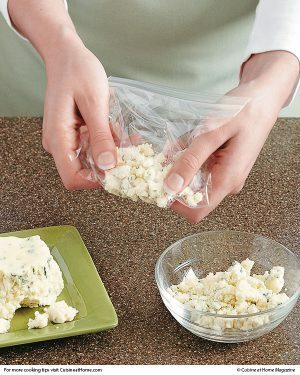 This simple and creative kitchen tip makes easy work of both crumbling cheese and storing it in a clean manner!